To a mosquito, I am the equivalent of a flesh-flavored Popsicle. If there is one of these holy terrors within an acre of me, I will get bit. Anyone else have this amazing talent? All over North America these buzzards of the bayous have wreaked havoc on hunters and fisherman alike. Tics and mosquitoes are typically more lethal than many apex predators when it comes to humans world-wide. Let’s start with some facts! 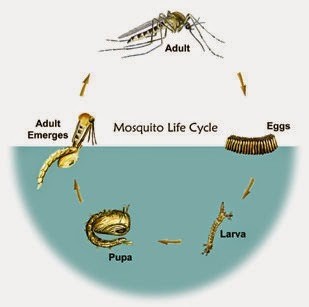 First of all a mosquito on average has a life-cycle of about 10-20 days. They get all their business on the reproduction end done quickly. The males feed on plant nectar and it is the females who do the real devastating as they require a blood meal to reproduce the 100-200 eggs they will lay. The females are attracted to your heat signature, your sweat and the CO2 you put off. How many of you have heard someone say, “Boy, I sure hope we get a cold winter to kill the mosquitoes!” BAD ANSWER! Mosquitoes have the amazing ability to simply stop their development until conditions are more favorable whether being completely frozen or too dry. This is why in places like Minnesota or Alaska, snow pack does not equate to low mosquito populations. In the south when we have a dry spell, the mosquitoes seemingly go away. In reality, it only takes one decent rain shower and they are all back completing their process again. So the real question is how can we protect ourselves without ruining our scent while deer hunting? Two schools of thought say go odorless protection or something that protects but also give off a natural scent. Let’s take a look at these two lines of thought. There are many different products to choose from when looking for a spray or squirt repellent but not many of these are odorless. The products I introduce here are known to work but I cannot guarantee success for you individually. Cutter Skinsations Ultra Light says it is an odorless type of spray on repellent. It is non-greasy and allows your skin to breathe. Active ingredient is Picaridin which is nice due to the health concerns Deet has caused over the years. 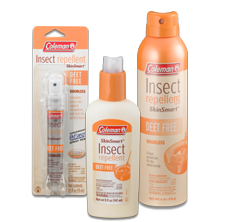 Coleman makes a line of products called Skin Smart. It too is Deet free with the active ingredient being Picaridin. It is odorless but does have an aerosol smell as it comes out of the can but that goes away quickly. It too is non-greasy and boasts 8 hours of coverage. Permethrin – This stuff is fairly amazing. You spray it on your clothes (NOT YOUR BODY) and let it dry before putting your hunting clothes on. It is designed to work for up to 6 washings. The warnings are quite frightful for Permethrin. Things like do not let it touch your skin, come in contact with any part of your body, etc. It doesn't repel see...it kills! As a father of a 2 year old, I simply cannot risk the hazards. If you have the ability to control the substance, this stuff works. Be diligent to follow the instructions. We don’t want stuff to start rotting off your body…right? There are a myriad of natural insect repellants. Some work better than others and you should test for yourself if all natural is the way you want to go. Most anything herbal is not going to be overly offensive to deer particularly if the smells are natural to your area already. A new-comer I found while doing the research is called Insect Defend Patch. It uses Thiamine (B1) technology to give you a shield of natural protection lasting a whopping 24-hours. 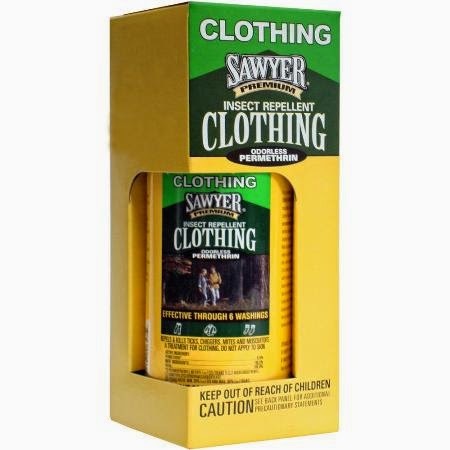 All Terrain makes a repellent called Herbal Armor with the active ingredients: Oil of Soybean 11.5%, Oil of Citronella 10.0%, Oil of Peppermint 2.0%, Oil of Cedar 1.50%, Oil of Lemongrass 1.00%, Oil of Geranium 0.05%. Not sure how the deer will take this concoction. Another great option is Thermacell. This tried and true repellent uses a small butane chamber to heat a scented pad that mosquitoes hate. Hunters mostly use the earth scent to keep the deer from catching a strange scent. 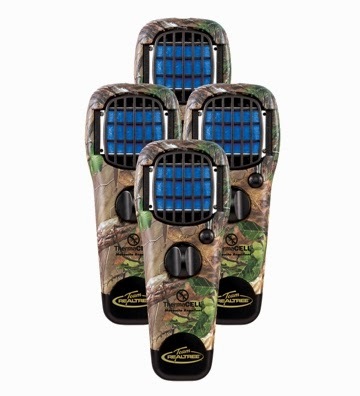 It gives 15 square feet of coverage and can run for 12 consecutive hours using the extra butane tubes and pads. One note of interest with Thermacell is that when in a ground blind you can begin to taste the stuff if you run for a good while. Be sure to turn it off and allow some fresh air in from time to time. Be safe from the real predators and happy hunting! Deer season is almost here. You have worked hard. You have prepped your site and you are confident in making the shot when it presents itself. You get inside the blind to wait for the deer to show up that you have documented on the trail cams and what happens…nothing. Why? Did you think of covering your scent? Oops. A deer has about 297 million olfactory receptors in their noses. In contrast, a dog only has about 220 million of these receptors(*). A deer can smell you long before they can see you if you are upwind. Since you cannot control wind direction, you are going to need some help to make yourself scent-invisible and maybe, just maybe, use their incredible sense of smell to bring them to you instead of pushing them away. 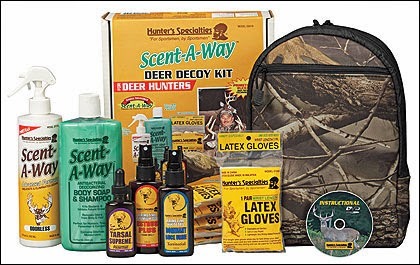 To, turn the table on the deer there is a wide array of scent blockers on the market today. Standing in the aisle at your local Bass Pro or Cabela’s can be overwhelming at the choices available on this one topic alone. They also offer entire clothing lines now that aid in masking your scent. I hear yah! I am not making the picture any clearer right? Sit tight and it will make sense. My wife’s brother, Kyle, is a firm believer in scent control. He is borderline fanatical about it which I happen to enjoy. From washing your clothes to washing Yo’Self, Kyle believes in being odor neutral. He also likes some of the products who seem to be a bit more proud than I prefer. After doing some research, I landed on using Scent-A-Way. It’s proven. It’s easy. And, you guessed it, it’s cheap – LOL! 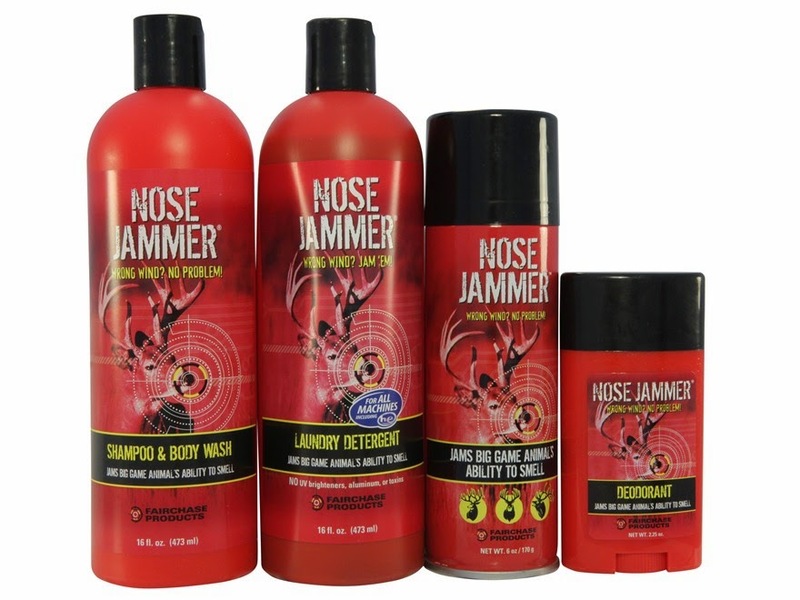 Kyle likes to use a product called Nose Jammer. It is a botanical mix that causes a deer’s nose to go into over-load and not smell you. While his mind will be attempting to sort out the different flowers that he smells, your scent never get’s picked up. We spray it on my wheel-chair's wheels and frame so that wherever I go, they never pick up the smells my tires might have from the house. The stuff smells great even to me and I do agree with him on one use for it to draw the deer in - more on that in a minute. To truly cover yourself you should really start with, wait for it.... yourself. Scent-A-Way makes a body-wash/shampoo that will get you clean without all the extra smell. I even bought their antiperspirant/deodorant which is also odor neutral. Next washing your clothes can help. You don’t want to walk into the woods with a loud Gain or Tide smell to travel through the forest essentially screaming to every deer in the near 50 acres to run like a scalded dog. Again, the options here are plenty. I actually agree with Kyle on this topic. 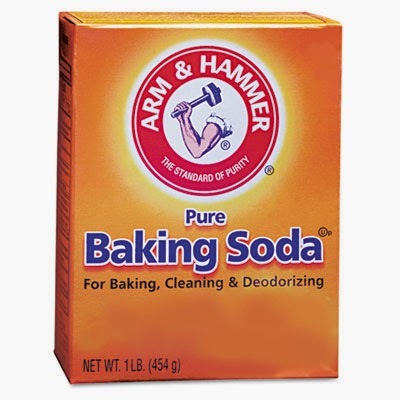 He washes his clothes with Baking Soda. It cleans and kills odors which is the goal right? It is also super dirt cheap. He even sticks his clothes in a plastic bag with baking soda to keep them odor controlled throughout the week. Okay so you have everything covered and the deer can’t smell you which is a good thing. Early in the article, I mentioned a way to use their sense of smell to lure them in…remember? I want to revisit that and give you a tremendous leg up. Deer can be conditioned like any other animal or human for that matter. In psychology class, I remembered the studies done by a famous psychiatrist named Pavlov. He placed a bowl of food down for a dog but would first flip a switch on a light bulb. The dog became conditioned that every time he saw the light even in the absence of the food, he began to salivate as if food was available right then. We began using Kyle’s Nose Jammer botanical spray in the same way. The smell is strong and pungent. It fills the woods quickly. So every time we poured fresh corn in the feeder or placed other deer attractants out, we were sure to spray this stuff around the area. So that when the deer smell this scent they would relate it to food or some other goody that we had left for them. In this way, we are readying the deer for the day that we are there for the hunt. They will have smelled this odor many times. Each time they have sensed this odor, it was a positive for them by way of something they needed. In short, I am gaining the edge on the wary deer. Now, for everyone who would object to this method as not being a fair-chase practice, I would remind them that we are doing this in my hunting area on private property. 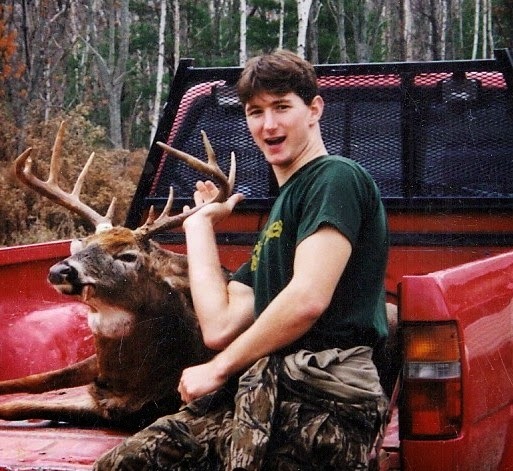 As a wheel-chaired sportsman, I don’t have the luxury of chasing a deer all over God’s creation in a fair-chase format. I applaud all the hunters who do and wish you the very best in this deer season. Give me some grace too huh? This way we can all enjoy the great outdoors, together! Logs, rocks, ruts, mud, brush, the great outdoors can be demanding and the basic fact is the majority of wheelchairs offered in the mainstream simply do not cover the demands placed on them by wild nature. It is the jumping off point. To truly get off the pavement and to get into primal wilderness requires particular tools to make that jump. This week’s article will hopefully give you insight into some of those tools at a price-point you can live with. Let me be frank, there are other options than the ones provided in this article; everything from home-made to uber-sophisticated international models. I recognize I am only giving you a slice and not the whole enchilada. However, what I am giving you is what some consider the best options available. So, take it for what it’s worth – ka’peesh? 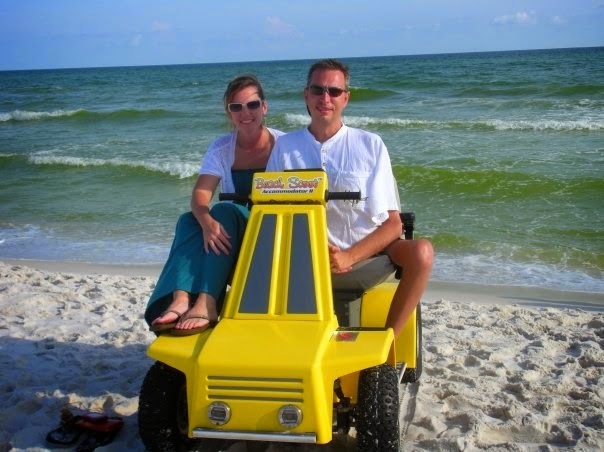 At the lowest cost is The Beach Scoot. Priced at $7,900 it is your basic 4 wheeled (back wheel drive only) scooter with bigger tires that help you stay above the sand, mud and brush. I have personally used one of these at the beach and they do work. Battery life was limited due to the sand. Terrain and body weight will always dictate the length of a charge. On solid ground, I am certain that the length of the charge would have been substantially better. I did get stuck in the sand once or twice but at the price, it is a serious option. Next up is the Action Track Chair and they offer a couple of options. As the name of the chair mentions, this is a tracked chair and can take on almost anything Mother Nature throws at it from the beach to the forest. They have a sit down model with a base price of $10,200 and a stand up version with a base price of about $15,000 that allows a paraplegic to raise up into a standing position. The chairs come with an awesome 5 year warranty on the frame and the tracks. I spoke with the dealer for my area, Mr. Doug Carlson of Carlson Mobility in Austin, Texas, about this chair and he is arranging for me to test it in the near future. Doug mentioned that one of the unique characteristics of this chair is that it has the ability to tilt backwards or forwards twenty degrees for riding on sloped terrain as well as for comfort. The company offers a mind-boggling 26 different accessory options that are available to add to the base price to help with any of your outdoor needs. The next chair in the line-up is the Trac-Fab. The company offers two different models. The first which is 36 inches wide has a starting price of $12,000. They also offer an ADA compliant model which is 30 inches wide and can navigate through the vast majority of indoor obstacles as well as outdoor terrain too. Price of the ADA compliant chair is $14,000. They even show pics of it exiting a vehicle which is an interesting twist as most of the others simply will not fit into an accessible van comfortably. Last up is a real monster! It’s called the RipChair 3.0. Yes it’s tracked but that is where the similarities end. You roll your wheelchair into the bay and lock in. You then crank the 30 horsepower, 4 stroke gas engine and away you go! Due to the fact that it is gas operated means you are guaranteed to not be limited by weight and terrain as in a battery operated electric chairs. They even have accessories like a snow plow or a mowing deck! Whuuut...are you kidding? No! Top speed is 17 mph. So, you are asking what this bad boy will run you, right? I couldn’t get them on the phone the day I wrote this article but I have been told that the base price is at or above $27,000. Hey if you have the cash, get the Cadillac. Know this though, the specs of this chair demands that you are going to have to put it on a trailer just like you would any other ATV. But, everything in a man says, “GIVE IT TO ME!” it will go where no one in a wheelchair has ever gone before. It truly is one small step for man and one giant leap for a person in a wheelchair. I wanted to end this article by thanking all of you for your loyalty in reading it each week. Due to your diligence handicappeodutdoors.com is now in the number one position on Google when you search for it. Yes, that's a big deal and I owe it all to you – Thanks! 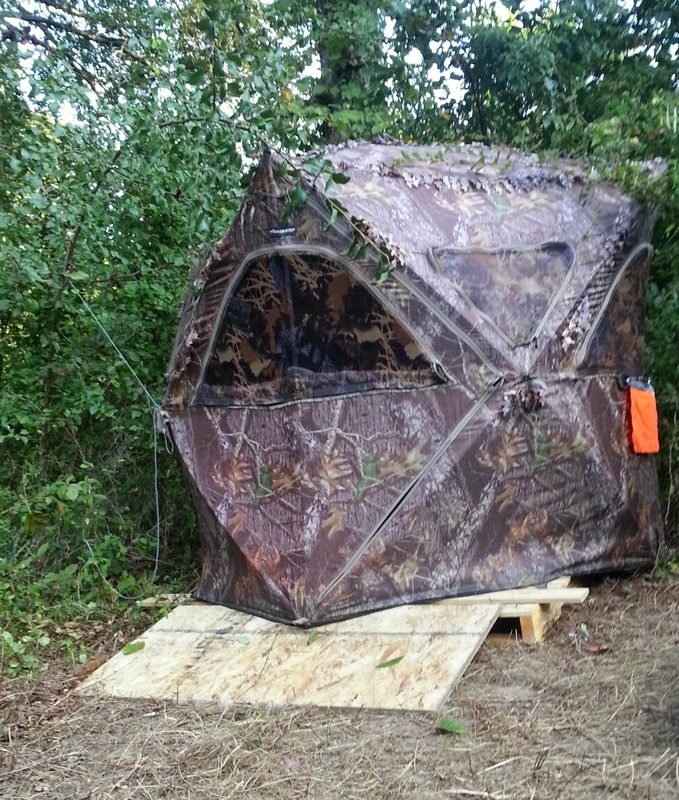 One of the things that a hunter should take seriously is the actual spot that they will be sitting and shooting from. All the preparation in the world will not result in success if you cannot take the shot with confidence when it avails itself to you. Taking the time to do this bit of diligence, can save you from a heart full of frustration if you have full use of your body. Iff you are in a wheelchair, it is critical. The real trick is to do it without breaking the bank and today I am going to show you how to do just that. Let’s start with a platform. It doesn’t matter if you are choosing to have your blind up off the ground a bit or directly on it, you need to think about the ease of moving your chair around and how much noise this may make. For the sake of the article, I am going to use the example of sitting at ground level. A simple solution that is prefabbed, strong, and durable is pallets. These amazing structures are used by all kinds of companies in receiving products and can hold amazing amounts of weight. They are also FREE! That’s what I’m talking about right? We found a fresh looking pallet that measured 4ft X 6ft as the base for the shooting platform. A problem that pallets present is that they have gaps. 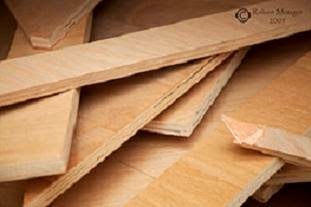 This is quickly resolved by adding discarded pieces of quarter inch plywood or particle board that you collect over time. If you don’t have any around the house, just start asking people. Just about everybody has a small amount of wood lying around that they are never going to use and will gladly give it to you. We also added a piece of plywood as a ramp for getting on and off the platform easily. 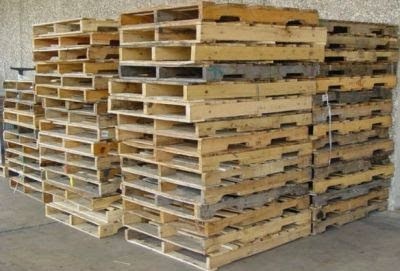 An important point here is that the entire top of the pallet doesn’t necessarily have to be covered. Test it and make sure that you can maneuver with ease on what you have added. Whatever works for you right? So long as there was a large area in the center that was covered, the edges didn’t exactly matter to me. All I really wanted was a nice level area to place my shooting tripod on and the ability for me to make a minor adjustment with my chair if necessary. Adjustments and deer do not exactly mix. Deer have almost super-hero hearing and are rather skittish if they hear metal on metal. That isn’t exactly a natural sound you know? Solution, a friend had some old carpet from when his house was built. We placed it on top of the plywood pieces to add a layer of quiet between my chair and the platform. This also helps with any small gaps that irregular shaped plywood pieces may create and allows the wheelchair to roll smoothly without dipping into a gap. Go to a local warehouse that sells carpet and ask for remnants that have been cut. Many times they will give this stuff away and I love me some free! Have you ever noticed tennis balls on grandma’s walker? They do this so that the walker is easier to move around. I added them for a two-fold reason. True, it does make the tripod easier to slide inside the blind. 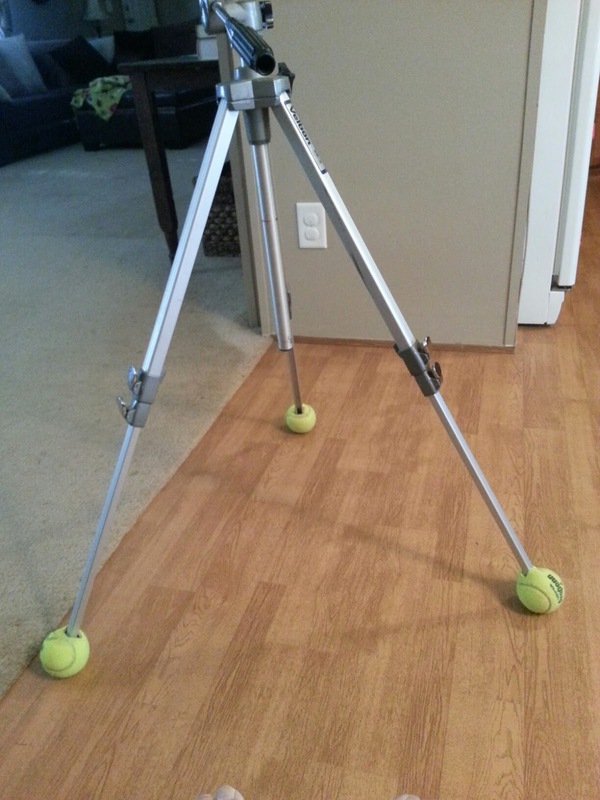 But, even more important is it gives your tripod some stealth because you can move it with almost zero noise. I asked the tennis coach at the High School where I teach if he had any old tennis balls. He gave me a whole bag...for free. Are you picking up on the theme yet? Once we had the platform assembled, I got on it and my buddy placed the blind over me. We made sure to adjust it so I had ample view of my shooting lanes. This way I know what to expect instead of guessing when the shooting is for real. It is wise to even take some practice shots from your platform so you are super-confident. Now all we have to do is wait for the season to open. I can make a good shot with confidence. If I have to make a small adjustment, I am also confident of a greater chance of not being detected. A platform also helps keep my wheelchair up out of the mud as the fall rains come in. You can use these same ideas to build something up off the ground but it may cost you a little more than free! Jeff Malloy was working on his house in 2004 as a young man of 24 years old when his accident took place. The avid outdoorsmen was standing on a ladder when in one tragic moment, he became a quadriplegic with a C3/C4 injury. 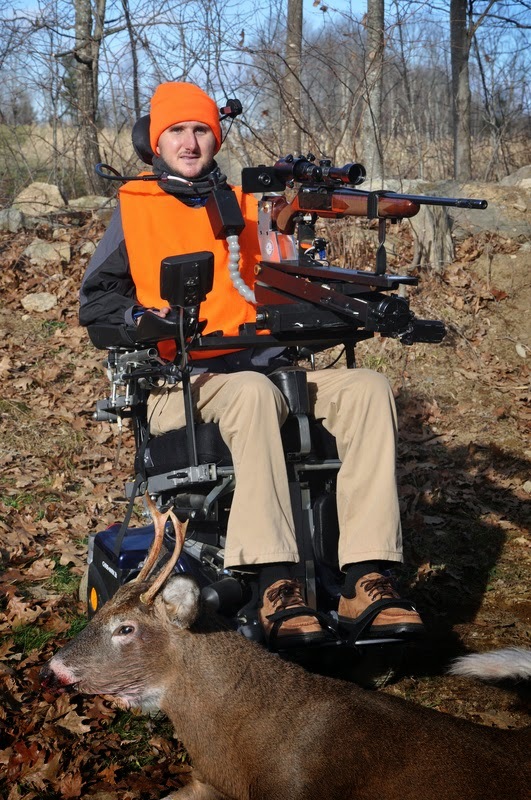 As anyone can imagine learning to deal with life in a wheelchair is brave enough, but after 5 years of being removed from his passion of hunting, Jeff determined in his heart to get back out there in 2009. He started by going back to college to learn engineering (wow right?) so he could design things on an CAD software. Ok, a quick side-bar here - Just for Jeff to do this part of his story is enough to make anyone want to stand up and applaud the guy. Engineering isn't exactly the program for the faint of heart. However, when you want to do something bad enough, is there really any obstacles that can stop you, him or me? Back to the story, He and his friend Ray Kimball collaborated to create a shooting system that he could use. So, they began searching to see what was already out there. 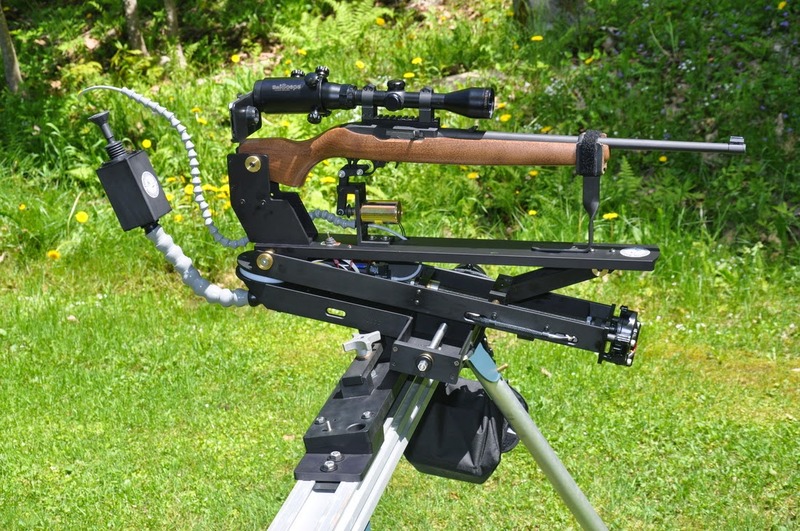 The good news was that there was a shooting system already created called the SR-77 for a quadriplegic to use. The bad news is that Bob Bowen, the owner and maker, had packed it in and closed production of the SR-77 platform. I have noticed in life that this is usually that pivotal moment that separates the winners and the not so fortunate. Lesser people hit a wall and quit. Jeff is a champion and quitting was never an option! So what does a winner do? He goes straight to the source! He contacted Mr. Bowen directly and asked for permission to use the SR-77 as the base design for his new shooting system to which Bob graciously agreed. So what started out as a personal mission, quickly became something much, much greater. They took the old SR-77 design and transformed it from a Subaru to a Cadillac. Once a prototype was finished, Jeff and Ray knew they couldn't withhold this new system from other hunters who had suffered injuries that it could help. So the Equalizer Shooting System was born. It has a flat black anodized finish along with over 60 custom machined parts. All these things combined make this system very durable, reliable and user friendly. If anything does happen to break down, all of the parts are replaceable. There are also many different options available for customization including Sip-and-Puff shooting for those who require it. 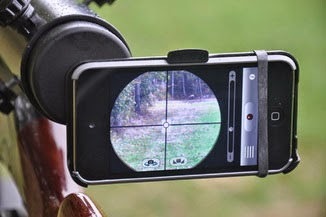 The next generation of the Equalizer Shooting System happened when it was combined with an iPhone application called the iScope. This application allows you to use the camera on your phone to look through the scope and give you greater accuracy. It also allows a hunter to record their hunts which is incredible. It is made to fit both iPhone and Android smart phones. Jeff admitted to me that he actually doesn't make much profit on the platform as the majority of the cost goes into the building of the application itself. So, not only is he brave and smart but he is also un-selfish. Jeff Malloy, I salute you amigo. May you have an epic 2014 hunting season and thanks for your contribution to all of us who are mobility impaired to place the cross-hairs on not just an animal, but the memory of a life-time!